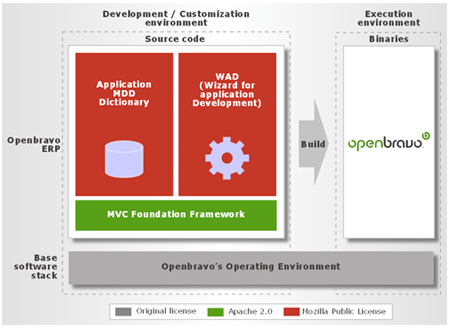 OOpenbravo ERP is built using open standards, around a unique combination of well-proven MVC and MDD development frameworks, executed by Openbravo's WAD engine. MVC is a proven web applications development framework, which helps to decouple the database, user interface elements, and business logic. The separation of these elements into different files results in a more structured code, facilitating development and maintenance. Openbravo also leverages on a number of recognized open source frameworks for a more efficient development process. The engine, built by Openbravo, automatically generates the application binaries from the MDD dictionary. The files generated by WAD are compliant with the MVC standard. Stores the metadata which describes each element of the application and its behavior. A set of sturdy programming utilities, either selected from the best open source candidates available or built by Openbravo when no candidates are available. These utilities facilitate web-based MVC application development. Composed of well-known third party applications such as Apache http Server and Tomcat, and a PostgreSQL™ or Oracle® database, that can be installed in a multitude of Operating Systems, including GNU/Linux or Microsoft® Windows®.